These notices are not required to include any health or safety information, and often none is provided. EPA only takes action to restrict or regulate about 10 percent of chemicals in the notices,[ii] which could be attributed to the absence of any safety information. The public inventory lists only basic information – such as the chemicals registry number, preferred name and molecular formula. A chemical’s synonyms, former registry numbers and EPA rule-making flags on a given chemical can be listed as well, but are not required. The confidential inventory includes chemicals that are submitted with confidential business information, or CBI claims and lists only those chemicals’ generic names, registry number and regulatory flags. What is not required in either lists are a chemical’s manufacturer, manufacturing location(s), production values, type of products the chemical is typically used in and any updates to manufacture or use including whether it is still being manufactured. 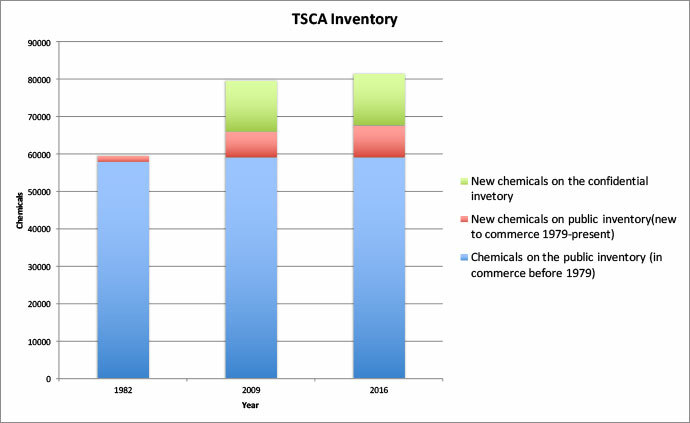 EWG’s analysis of the TSCA inventory as of March 2016 inventory found that the total number of chemicals listed increased from the original 60,000 to more 85,000 chemicals. The public inventory provides unique identifying information on just 67,634 chemicals. Of these, 8,475 are identified as having been added after publication of the inventory in 1982. There are an additional 13,975 confidential chemicals submitted under the new chemicals process that are listed only under a generic name and a generic “accession” number. EWG’S 2009 analysis showed that the identities of two-thirds of the chemicals introduced since 1979 were confidential. There has been no significant change since then.